Louisiana Iris - "I. vinicolor"
"Vinicolor" was one of many species name once given to collected irises that turned out to be natural hybrids. "I. vinicolor" apparently is a first generation hybrid between red I. fulva and blue I. giganticaerulea. 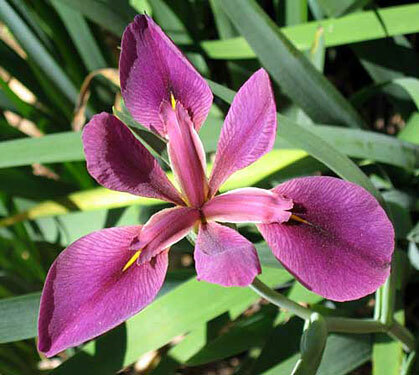 A first generation cross between the two produces a wine colored iris, tall like giganticaerulea but with the clear color influence of fulva. These irises are often found in yards in New Orleans, Baton Rouge, and undoubtedly other cities and towns in Louisiana. They are tall and will grow to around four feet in the garden, taller if in water.